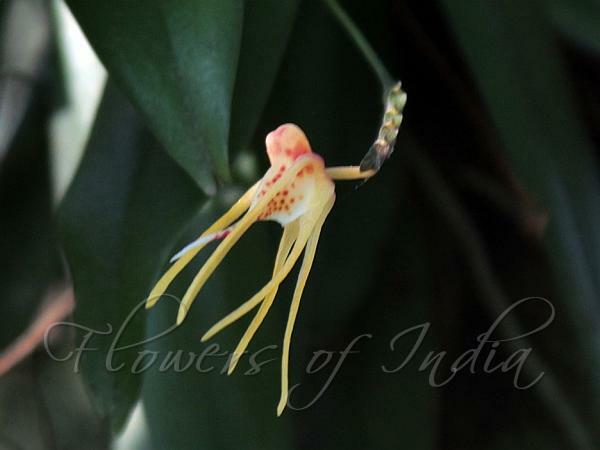 Thread-Petal Hairseed Orchid is a mini-miniature sized orchid growing on tree trunks in moist areas with a very short, flattened stem carrying 3 to 5, lanceshaped, pointed leaves which are gradually narrowing below into the clasping base. In the leaf-axils, the plant bears short up to 20 cm long, round, zigzagged inflorescence with a congested axis carrying 2 ranked, flattened bracts and 1-2 flowers that open simultaneously and last over a long period in the summer. Flowers are yellow, scentless, sepals and petals yellow, thread-like, membranous, 2-2.5 cm long, narrowly lanceshaped, linear-oblong, tapering. Lip has a large sac rounded at the base, white with yellow and reddish-brown spots, tip white, delicately veined, contracted in to a capillary tail; column light yellow, deeply saccate, foot less, very short; pollinia 2, light yellow, membranous, club-shaped, stalkless on a rather large gland. 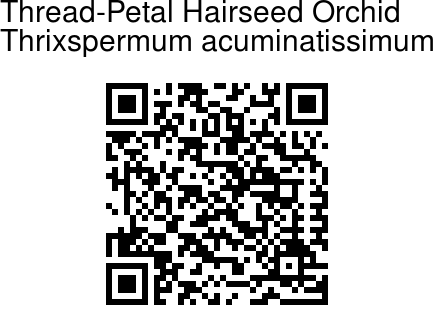 Thread-Petal Hairseed Orchid is found in Assam and SE Asia, at altitudes up to 100 m. Flowering: November-March.